Time is not my friend most months as over and above work commitments I also have blogging commitments. This all has to fit in with going to gym, running a household, being a good wife and having a social life. Over and above that, house building is a priority most weekends. I try to schedule my blogging and my cooking to suit my life style. That means that I cook for my blog on one day of the weekend. I will spend the entire day in my kitchen and then write up one blog post each morning. However, in the month we go overseas (which is this month) I try and write two blog posts a morning in order to have posts scheduled for when we are away. I have an hour before work each morning to sit down and do this. This month my Secret Recipe Club assignment arrived in my inbox 14 days before it had to be posted. Our posting time is 7am South African time, which happens also to be the time I arrive at my office. So basically, this post had to be done and dusted within 13 days. Now I know that it might sound like a lot of time but actually it is not! I am a little miffed as I wanted to give Jamie from Cooking With Moxie a bit more of my attention. Jamie lives in Boston and my heart already goes out to her knowing that tragedy was so close to her doorstep not too long ago. I love her saying “Tutti Mangia”! Everyone who reads my blog will know that I am a secret Italian – it is my favourite country to visit, and the one European language other than English that I love speaking. This month all I had time to do was click the random recipe button and aimed to choose the first recipe that came up that was an original recipe. It also could not be a sweet recipe as I have too many desserts to test already this month. I clicked and clicked, in between reading emails, responding to queries and doing paperwork. However, all of the recipes that came up were not original and so I turned to my second option and chose a pasta recipe. I picked the first pasta recipe on the list when using the term pasta in the search box and chose the Fettuccine Marinara with Two Ricotta’s. I have not cooked much with ricotta so it was a good excuse to use a relatively unused ingredient in my kitchen. I then had to make the recipe on the first Sunday night after my assignment was received, and hope to high hell that it worked. Of course as my luck would have it, Sunday arrived and I did not have time to make the pasta dish as I was hosting a Spanish themed meal for friends and I had to make my pain au chocolat for the I Made It challenge. So I fluttered my eyelids, broke the diet, and had Dave make the linguine marinara con ricotta for me last Monday night. I was in Cape Town at a function and he did all the preparation. I am so lucky to have that extra pair of hands in the kitchen! We loved the tomato flavour of the pasta sauce and as we only used half I added some bacon to it the next night and served it as a side dish with some pork chops. How do you manage your blogging time? Thanks for the kind words – what a great pick! I feel like I made that SO long ago but I forgot how good it was! It was a great pick! What a wonderful recipe! This is definitely a “must make” for me! You’re so dedicated, Tandy! I’ve been offline a bit lately – life has just been so hectic. I manage my blogging time by trying to prioritise everything else, otherwise I sit in front of the computer all day and nothing gets done! 🙂 Lovely pasta – did you know that over here ‘marinara’ is ALWAYS seafood? LOVE that this dish is so easy! I adore ricotta! I will use more ricotta from now on for sure! that is a great plan Rita! My life has always sounded hectic! this looks wonderful–i have ricotta and i am making pasta on Saturday–so my recipe for Saturday all sorted–and today is only Tuesday. I have no idea how you manage to fit so much into your week–i wish i had the energy and the organisation skills to do half of what you do. You can never go wrong with Ricotta 🙂 Looks yummy! This looks incredibly tasty! Have not had dinner yet and just wish I had it right now. Glad to be part of SRC group C with you! This looks delicious and as an added bones, I think my kids would eat it, too! Time?….Nope, still don’t have an answer for that. I often wonder myself. I love ricotta on anything, so this pasta looks amazing. Great idea for a weekday dinner. Its perfect for a weekday meal! Tandy, I’m a secret Italian also, or maybe half French half Italian? Great tip on adding bacon and using it as a side the next night. Looks like a perfect summer pasta, sorry the time didn’t work out for you this month, it sure isn’t fun being stressed about cooking, takes most of the fun out of it! It does take the fun out of it! Mmm, YUM! You have such a full life AND bring us such yummies—you’re a superstar!!! Oh Tandy, I’m certainly struggling.. There just isn’t enough hours in the day for me!! I work full time, have a crazy toddler and try to fit a blog post atleast every 3-4 days and it’s so bloody hard!! That said, since starting blogging, it has brought so much happiness and meaning into my life I just can’t imagine giving up anytime soon. Keep up the great recipes 🙂 This looks great! Let me know when you find the balance! This pasta looks super succulent…What a great, complete meal!!! I love meals like this when I’m low on time! Pasta is always good! saying that Tammy, your blog always pops into my reader at just the right time! Very good recipe. Definitely on my list of summer dishes, once the warm weather arrives. Thanks for being so dedicated.Enjoy reading your writing. Gorgeous looking pasta dish Tandy. I’m bookmarking this one to try. thanks, let me know what you think of it! Madness that we are all always so busy. I haven’t made pasta for the longest time. This is a lovely simple flavourful dish. How delightful! 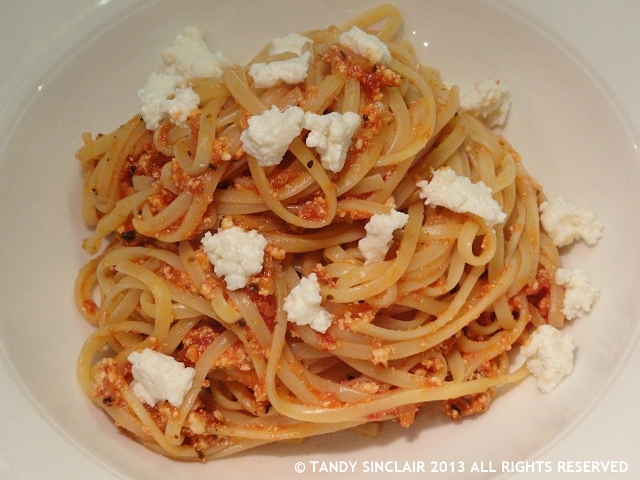 Have never added ricotta to this and have to try: it would add both taste and body to the dish! My family has flown the coop and I don’t have my own blog for practical reasons – I even work from home [albeit long hours! ], but with work, study, garden, organizational work, friends and just reading the delights my blogroll has produced leaves me behind the eight-ball almost every day!! Part of ‘modern’ life methinks 🙂 ! You do sound busy, but glad. You found tie to whip this up. What a delicious looking dish and it sounds so quick and easy to make too. morning, i so know how you feel – trying to fit everything in 🙂 but you are doing so great. Lovely post and i want to try this .